Users have been circumventing the limitations using modified software. Spotify may have 159 million active users, but only 71 million of those are paid subscribers. It makes sense that the company would want to maximize the number of paying customers, especially in light of the company's recent moves to go public. Now, it appears that Spotify is cracking down on free users that take advantage of hacked apps in order to remove the restrictions of unpaid accounts, according to TorrentFreak. Until now, Spotify hasn't put much effort into policing the actions of those who are pirating its service. These users sign up for a free accounts, then download a modified Spotify installation file, which allows them access to the premium service without having to pay for it. But over the past few days, Spotify has sent emails to unpaid accounts taking advantage of the modified software. TorrentFreak obtained a copy of it, which is replicated below. 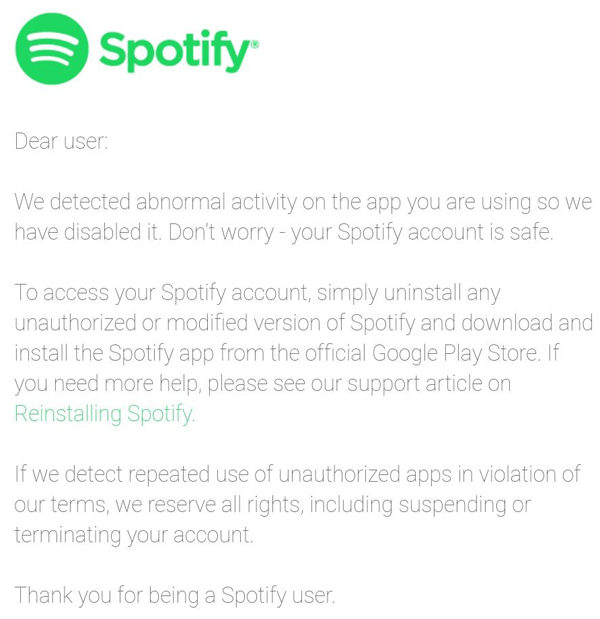 In the email, Spotify says, "If we detect repeated use of unauthorized apps in violation of our terms, we reserve all rights, including suspending or terminating your account." This makes it clear that the streaming service is not playing around when it comes to these pirated accounts. TorrentFreak reports that it has contacted Spotify users with free accounts that have taken advantage of the hack; some report they did not receive the email, while others have found that their modified apps no longer work.